Fluorinated amino acids (p-fluorophenylalnine highlighted in the interface) help stabilize Teflon-like proteins against heat inactivation, allowing them to function more robustly, even at elevated temperatures. (PhysOrg.com) -- More than 50 years ago, NYU-Poly alumni John Gilbert was asked to evaluate a newly- developed material called Teflon. His experiments using the fluorinated polymer as a surface coating for pots and pans helped usher in a revolution in non-stick cookware. Today, NYU-Poly Assistant Professor of Chemical and Biological Sciences Jin Montclare is taking the research theme in a new direction, investigating fluorinated proteins -- a unique class of proteins that may have a wide range of applications from industrial detergents to medical therapeutics. In a paper published in the current issue of ChemBioChem, Montclare and Peter Baker, who just received his doctoral degree from NYU-Poly, detail their success in creating proteins that are considerably more stable and less prone to denaturation than their natural counterparts. These qualities enable them to retain both their structure and function under high temperatures in which other proteins would simply break down. Inspired by the ability of fluorinated polymers like Teflon to stabilize surfaces, Montclare and Baker set their sights on developing a process that would allow them to reinforce the interface of proteins, rendering them more resistant to degradation. Through a trick of genetic engineering, the scientists were able to coax a strain of bacteria into taking up amino acidsthe building blocks of proteinthat were chemically altered by the addition of fluorine. Nature doesnt make fluorinated amino acids, but these experiments show that we can create them, said Montclare. 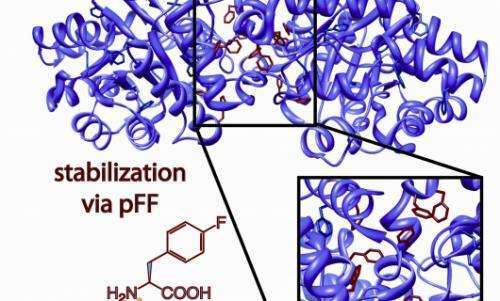 The result was a "fluorinated" protein that can withstand temperatures up to 140 degrees Fahrenheit with no compromise in activity or function. Next up for Montclare and Baker are experiments to test the limits of their success in creating fluorinated or Teflon-like proteins. Theyre hoping that this type of effect can be achieved with a wide range of proteins, especially those used in medicine including some therapeutic cancer drugs. The stable proteins may also some day act as prophylactics to combat exposure to neurotoxic agents (including warfare agents)something that is of interest to the Department of Defense. The scientists hope to improve the proteinsdurability and decrease the need for precise storage conditions, which often include refrigeration to prevent breakdown. This is promising and sobering to me. The horror in my mind is that if this technology is not properly guarded; bacteria which can create protein polymers that withstand up to 140 degrees F.
If a protein is created that can infect humans; while the bacteria may die, the new proteins will not be destroyed by a fever and what does that mean for humans or other life forms? I am not a scientist do please don't give berating comments if you are; please use your comments to educate a lay person who has a question vs making a declaration. Sita: I think all these latest developments in nanotechnology are both "promising and sobering".